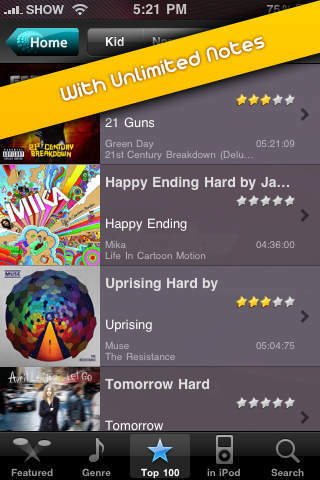 Do you like to play music games with your own songs in your iPhone? Like to Play Games with Your Friends? Want to go beyond simple taps? Need for dynamic experience? Download Boom Shake! ** Red Line is where you do gestures. touchreviews.net : If you think that Boom Shake is just going to be another rhythm game in the same style as all the other, a tap here and shake there etc… then you are in for a surprise. … iPhone Gamers, it’s up to you to help make this great game reach it’s potential. 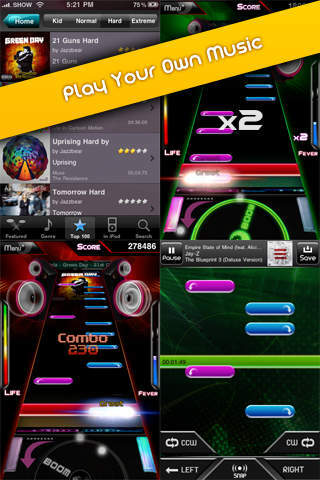 appspy.com : It's the creation and sharing tools however that make this a must for any rhythm game fan with an iphone. Boom Shake is the revolution you have been waiting for! 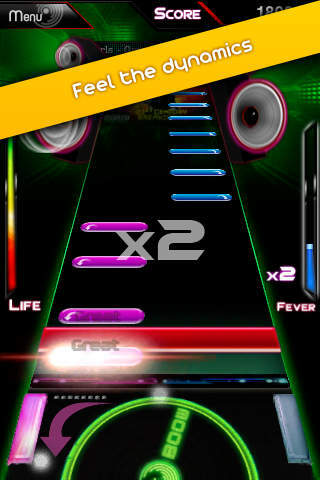 It allows you to play your own music collections with dynamic moves. Do swipes, circular gesture and hand snaps to play music that is straight from your library. Make notes and download them pre-made by others! No more restriction on your music! 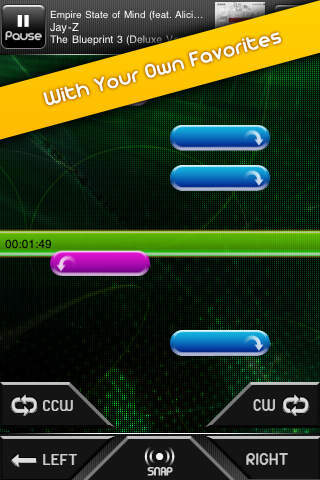 While other games make you play only a few songs, Boom Shake allows you to play songs what you’ve always wanted! You can download notes instantly from our note network, and you can even make your own notes. What is more, you can upload your notes and earn Booms! Lefts, Rights, Turns, Snaps. No More Taps. Be Creative! Pick your favorite songs, make your own notes and share with others. Bonus? Booms that can be used for downloading many more notes! Post Your Scores and Get Booms! Be Combative! Put yourself in the top 100 score list and earn Booms. The higher, the more! Be Social! Enjoy features with OpenFeint, Twitter, Facebook. Post Your Scores to Your Favorite Social Networks! Introducing the new challenge mode. You will be empowered to play your music interactively with your own buddies. Now you can compete scores with your friends and beat their rankings . We integrated a fully functional Push Messaging Feature into the Boom Shake. It will let you to send and receive messages instantly with your friends! The Friends menu will be a new gateway to communicate with your friend and share ranking data. Leave Comments! Be the First One to Leave a Comment for a Note and Get 7 Booms!